The spatial stability properties of a mixed convection boundary layer developing over a heated horizontal plate is studied here under linear and quasi-parallel flow assumption. 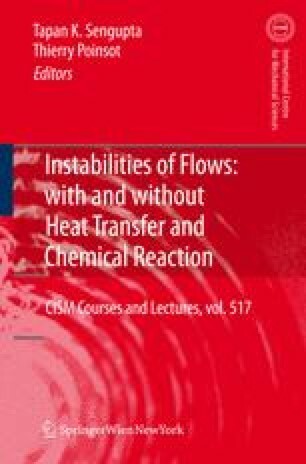 The main aim of the present work is to find out if there is a critical buoyancy parameter that would indicate the importance of heat transfer in destabilizing mixed convection boundary layers, when the buoyancy effect is given by Boussinesq approximation. The undisturbed flow used here is that given by the similarity solution of Schneider (1979), that imply the wall temperature to vary as the inverse square root of the distance from the leading edge of the plate. The stability of this flow has been investigated by using the compound matrix method (CMM)-that allows finding all the modes in the chosen range in the complex wave number plane for spatial stability analysis. Presented neutral curves for mixed convection boundary layer show the existence of two types of disturbances present simultaneously, for large buoyancy parameter. One notices very unstable high frequency mode when the buoyancy parameter exceeds the above mentioned critical value. This unstable thermal mode is in addition to the hydrodynamic mode of isothermal flow given by corresponding similarity profile.